click photo to enlarge We were staying in Carmel and one morning went for a drive along the coast. We were heading to the Point Sur Lighthouse for a tour. The tours are led by volunteers and unfortunately they did not have a volunteer to do the tour the day we were there. 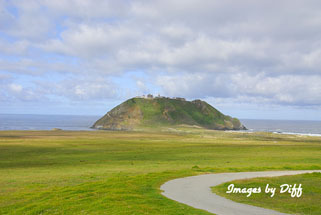 Point Sur was always a navigational hazard so in 1989 the lighthouse at Point Sur was opened. The Point Sur lighthouse contained the largest series of lenses the Fresnel first order lens. 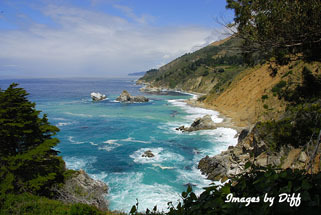 We had out lunch with us so we continued along the coast line down to Big Sur. 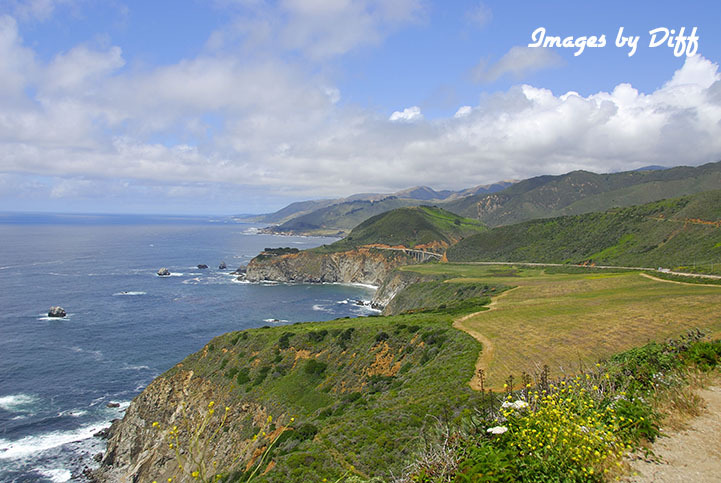 click photo to enlarge In the picture to the left is the Bixby Bridge.The Bixby bridge was important because it linked automobile travel to the Big Sur area when it was built in the 1930s. The bridge is 720 feet long. 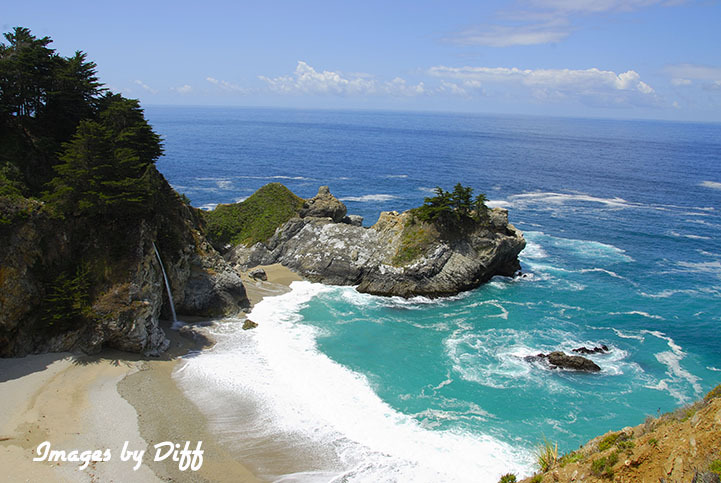 Before the bridge was built travelers had to take old wagon roads to get from Monterey to the Big Sur valley and the trip could take 3 days. 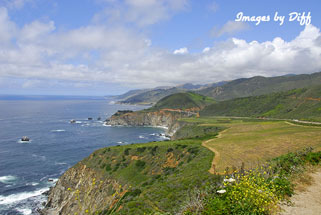 Now it is a 30 mile drive along beautiful coastline. click photo to enlarge The Point Sur lighthouse is on the picture to the left. The picture in the lower left is at Pfeiffer Beach, which is part of the National Forest system. 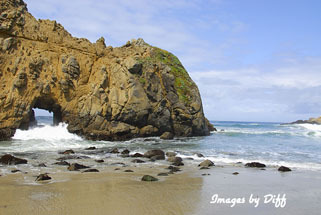 There are no signs on highway one for this beach you have to know it is there. It is reached by a 2.5 mile, one lane, downhill twisty road. The parking area is small so I suspect they don't want a large stream of traffic trying to navigate down to the beach. If you are able to find it the beach is day use only but well worth the trip.